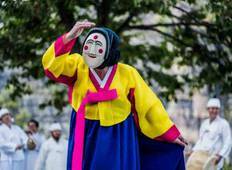 Find a Historical trip that explores South Korea. There are 7 tours to choose from, that range in length from 3 days up to 10 days. The most popular month for these tours is May, which has the most tour departures. "We annoyed overall this tour." "everything was just excellent. Our guide Marc kept everyone engaged, teaching us..."
"The TourRader and Bamba itinerary indicated 7 lunch meals to be provided, we were..."
"The tour showed us small glimpses of Korean history without spending too much time..."
"Funny, kind, english speaking guide who was very knowledgeable about the discover..."
"Highly recommended! South Korea has such a rich history & culture - a beautiful country...."